PHILADELPHIA-BORN, Berlin-resident jazz guitarist/keyboardist Kurt Rosenwinkel’s career is especially associated with influential artists such as Gary Burton, Paul Motion, Brad Mehldau and Chris Potter. So the sunshiny, vocal emphasis of his new release Caipi comes as something of a surprise. Yet it’s a surprise which prompts fascination, increasing endearment and positivity. Rosenwinkel suggests that it’s taken a decade to make this album a reality – and whilst it’s very much a solo album (the composer playing guitars, bass, piano, synth and drums throughout, and also occasionally taking lead vocal), he also welcomes a number of guests to provide a panoply of textures, including appearances from saxophonist Mark Turner and vocalist/lyricist Amanda Brecker. There’s even a subtle cameo from Eric Clapton, who describes Rosenwinkel as “a genius – he really is”; and the album’s decidedly effervescent South American flavours (‘Caipirinha’ being a Brazilian/Portuguese cocktail) are enhanced by the intriguing vocal timbres of young Brazilian singer/instrumentalist Pedro Martins. This full hour’s eleven-track diversity might initially be perplexing, especially for fans of the guitarist’s instrumental-jazz back catalogue. But it doesn’t take long to warm to the naive frailty of Pedro Martins’ gentle voice; and though Rosenwinkel’s straight vocal delivery may be reminiscent of ’70s prog instrumentalists who came from behind the frontman’s shadows to sing for their own solo projects, it’s these constantly fluctuating points of difference, plus a tangible homely quality, which attracts. The background to this bold, intentional move is explained thus: “Writing songs with lyrics has always been very much a part of musical world, but they’ve usually stayed in my private sphere. With Caipi, I realised that these were also lyric songs and that ultimately I would sing them as well. It’s definitely something different from my other albums, but it’s a familiar place for me and it was just a matter of doing what the music needed”. A sultry bossa nova influence is there from the opening of the title track, its wordless backing vocals and flute-voiced synth redolent of Pat Metheny or The Isley Brothers, with Rosenwinkel’s electric guitar improv reaching up to an azure sky; and Martins’ tremulant falsetto sails across the gently bass-driven gossamer-sustained layers of Kama. The contrasting pop chirpiness of Casio Vanguard and Summer Song quirkily recall the pop-jingle of ’80s band Johnny Hates Jazz, though brimming with invention and detail, whilst Methenyesque Chromatic B‘s babbling electric bass underpins its Latin piano-and-guitar pulse. Shadows-style riffs support Rosenwinkel’s affirming vocal in purposeful Hold On (“…and you know we’re not alone”); and the folksy tenderness of Ezra, dedicated to his youngest son, is similarly uplifting (“live each day with joy and laughter”) as Mark Turner’s tenor sax extemporises broadly over a mid-rock groove. By now, it’s possible you’ll be hooked… only to discover Rosenwinkel still has four more appealing numbers to deliver – Little Dream and Casio Escher (both embellished by Amanda Brecker’s vocal dexterity), bossa shuffler Interspace and anthemically-closing Little B. An album which is both curious and distinctive, it leaves a beautiful impression of radiance and hope, and is described by its creator as “angels working for the light”. Released in UK/Europe on 10 February 2017, and in the US on 30 March 2017, Caipi is available from Heartcore Records as well as iTunes, Amazon, etc. DONNING HIS SPACESUIT, pianist/composer Neil Cowley joins with fellow primates Rex Horan (bass) and Evan Jenkins (drums) in this, their sixth album – and as Spacebound Apes, they head for galaxies anew. Linked to a developing online blog and interactive digital experience (as well as a live visual event to be staged at Union Chapel, London, in October 2016), this tale of middle-aged Lincoln taking a hallucinatory journey into the cosmos finds Cowley unabashed in labelling it a ‘concept album’; and he explains that he’s been working towards the project for a long time, its immersive development taking in themes of guilt, loss and longing. But however deeply the trio’s ambitious vision is embraced, its eleven instrumental tracks also stand alone as an increasingly enticing, varied and progressive soundscape. With Cowley prominent on piano, hyperspatial beauty rubs shoulders with boisterous stomp throughout these 45 minutes – so the electronically-pulsed launchpad preparation of Weightless evolves into the whispy, crescendoed minimalism of Hubris Major before arriving at a jaunty, martial piano strut in Governance, its percussive metre breaking free whilst Cowley’s lyricism contrasts well; and the memorably propulsive synth groove of The City and the Stars offers more than a semblance of OMD’s ‘Enola Gay’. The album’s delicate piano interludes are especially effective. Grace‘s restrained ‘bridge over Satie’s water’ possessing a distinct, Rachmaninov-like romanticism; the endless, reverberant journeyings of Echo Nebula and The Return of Lincoln are, at times, reminiscent of The Enid; Duty to the Last suggests the contemporary jazz of e.s.t. or Michael Wollny; and later in the story, Death of Amygdala’s piano nocturne eloquence is swelled by the affecting grandeur of a French horn quartet. But Cowley and co. also like a good pop romp – and The Sharks of Competition‘s relentless Stranglers-punk is counterbalanced by the blithe, synthy delights of Garden of Love. Whatever genre your might hook on it, the Neil Cowley Trio’s multi-faceted approach rebounds across the musical universe, its strains repeatedly a joy to hear. Released on 16 September 2016, Spacebound Apes is available from Proper Music and various retailers. Videos: Grace, The City and the Stars. I’VE BEEN TOWING this little beauty around for a while now… and travelling with it has only served to deepen the pleasure. Let’s Get Deluxe is the third album from ‘transatlantic supergroup’ The Impossible Gentlemen, following on from 2013’s Internationally Recognised Aliens. With guitarist Mike Walker and pianist/multi-instrumentalist Gwilym Simcock in the compositional driving seat, they once again hook up with bassist Steve Rodby and drummer Adam Nussbaum, and are augmented for the first time by saxophonist, clarinettist and flautist Iain Dixon. Maybe it’s the fine UK/US instrumental blend which makes the Gents’ music so pleasingly difficult to categorise. Certainly there’s the contemporary jazz styling of Pat Metheny (with whom Simcock has recently been touring) and John Scofield, or even Weather Report; but there are also American-rock hints of Little Feat and Steely Dan, not to mention a touch of prog and a dusting of good old British whimsy. It all adds up to an hour of exquisitely arranged, multi-layered, seamless performance which sparkles with rhythmic verve and blitheful melody. The reputations of Walker and Simcock go before them, their individual prolificacy enriching the world of jazz quite immeasurably. But here, the sense of them relishing their North West English alliance is especially evident, with free rein to take these collaborative compositions wherever they please as they sumptuously layer-up the arrangements (assisted by Steve Rodby’s considerable production expertise). Title track Let’s Get Deluxe bubbles to an anthemic post-prog groove featuring Simcock’s lithe piano soloing over a full, sleek arrangement which enjoys the mellow beauty of his French horn and Walker’s typically soaring jazz/rock lead guitar improv. A Fedora for Dora‘s snappy rhythms, so characteristic of Simcock’s piano work, are energised by Rodby and Nussbaum – and, as often is the case here, the weave of supporting instruments (bass clarinet, French horn, tuned percussion) creates so much interest across this unfolding soundscape. Presumably inspired by Gwilym Simcock’s love of the ‘beautiful game’, Terrace Legend excitedly simmers to Zawinul/Santana-like keyboard-and-guitar phrases before exploding into percussive euphoria, only paused by distant, evocative crowd chants; and grungy, dimly-lit Dog Time – with particularly effective bass clarinet and tremulant Hammond pairing – finds Mike Walker at his bluesy, mischievous best as his guitar repeatedly howls to the moon. Purposefully shuffling, countryfied Hold Out for the Sun is melodically bright enough to be a TV signature tune – and despite its breezy openness, the many instrumental comings-and-goings along the way are delightful. Friend, colleague and pianist, the great John Taylor, is remembered in It Could Have Been A Simple Goodbye* – a poignant, affectionate tribute whose lush stateside arrangement is redolent of Lyle Mays. Propane Jane‘s Scottish marching band feel soon breaks into jabbing Fender Rhodes-led ebullience, Mike Walker’s gutsy, colourful, harmonic guitar a runaway joy; and bucolic closer Speak to Me of Home, featuring Iain Dixon’s soprano sax, possesses a simple charm enhanced by Steve Rodby’s gently pliant bass improvisations. The Impossible Gentlemen have developed a keen following on the strength of their first two releases and their entertaining live shows. This full-of-life album feels like their best yet. Released on 1 July 2016, and launching at Manchester Jazz Festival on 26 July, Let’s Get Deluxe is available from Jazz CDs, etc. *Video, from 2015 – live at Sligo Jazz Project: (It Could Have Been) A Simple Goodbye. I AM REMINDED of a golden age of TV themes. Statuesque 1960s/70s tunes and traditional orchestrations that have remained in the mind, the merest few bars’ snippet triggering inextricably-linked carefree memories. Manchester composer and bassist Matt Owens seems to capture such a spirit in this fine debut of charming, sometimes quirky, and beautiful creations. Happily difficult to pigeonhole in terms of genre, with elements of jazz, folk, pop and movie soundtrack, Owens draws on an abundance of instrumentalists and vocalists (below) to convey the character of his distinctive writing. 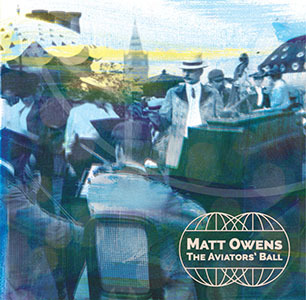 The majority of The Aviators’ Ball (a title inspired by Owens’ real-life discovery, in Prague, of an aviation society’s ball!) comes from his suite Ten – one of Manchester Jazz Festival’s excellent mjf originals commissions – and unabashedly seeks a mostly acoustic landscape of waltz, curtsy and blithe melody. With woodwind, brass and breezy Irish tin whistle, Raindrops on our Rooftop immediately makes that retro leap, its persistent bassoon figure suggesting an era of Puppet on a String and marginal folk/rock band curiosity Gryphon. Title track The Aviators’ Ball exudes all the warmth of gentle period drama as mellow cornet improvisations float over piano and tea-parlour strings; and then – with a cosy woodwind intro redolent of… that’s right… The Clangers! – singer and guitarist Tom Davies delivers his winsome Mouse Song with unexpected and touching simplicity. As sunshiny as a beach-bound, open-top Morris journey, the crisp, wordless vocal momentum of Going Back to the Village confirms Owens’ picture-painting prowess, arranged here by Manchester favourite (and co-producer of this album) guitarist/singer Kirsty Almeida; and the folksy theme of Every Wish is for You, initiated with pianistic nursery-rhyme candour, rolls along to placid trumpet and flute extemporisation. The singular, expressive voice of Rioghnach Connolly interprets Celtic love song Black is the Colour like no other, her affecting tones breathing “I love the ground whereon he stands” like changeable winds across heather land. Soft-pop The Peanut Train shuffles to Owens’ downy horn-and-woodwind arrangement; Monsoon is similarly entrancing, led by the impassioned vocal of Zoe Kyoti; and full of dreamy nostalgia, Violet concludes the set, once again highlighting Matt Owens’ aptitude and greater potential for niche soundtrack scoring. In an album which might initially appear quaint, due to the genuiness of its eclectic, yesteryear approach, the persuasive strength of its endearingly tuneful hooks and arrangements make it utterly irresistible – certainly a delightful musical diversion. Launching at Chorlton Arts Festival on 18 May 2015, The Aviators’ Ball is available from All Made Up Records. LAST SUMMER, saxophonist and composer Phil Meadows released his quintet album, Engines of Creation – a remarkably accomplished debut from a musician whose ambition and drive are clearly on course to earn him a place in the upper echelons of the London jazz scene. Confirmation of his achievements to date (including continued involvement with NYJO), as well as recognising his potential for future success, have come via two accolades: Parliamentary Jazz Newcomer of the Year and the Peter Whittingham Jazz Award. Phil Meadows’ larger scale project, Engines Orchestra, is an ambitious group of twenty young London-based orchestral musicians who, directed by Matt Roberts, collectively seek to challenge conventions through stimulating, cross-genre, written and improvised music. For this debut recording, Meadows has created his colourful and unpredictable Lifecycles suite which melds the diverse textures and dynamics of both orchestral and quintet sound worlds, pressing into action again his Group colleagues – all rising stars in their own right – Laura Jurd (trumpet), Elliot Galvin (piano), Conor Chaplin (basses) and Simon Roth (drums), plus adroit vocalist/violinist Alice Zawadzki. The fusion of jazz soloists/bands with orchestra is, of course, nothing new – one only has to look at the seminal late-’50s/early-’60s projects of Miles Davis and Gil Evans, right up to Trish Clowes’ exciting new release Pocket Compass. Such a concept has never been without its critics as, in unaccomplished hands, it can become a laboured, incongruous, cold exercise – but, thankfully, recent collaborations have proved to be both sophisticated and organic, highlighting that there is still much to be discovered and achieved by breaking down perceived barriers. “Lifecycles“, the composer describes, “explores a series of situations that we all experience. The people we meet, love and lose shape our emotional responses” – and the result becomes increasingly captivating. Missing Days, which opens the ten-track sequence, bustles to the brilliance of the orchestral scoring (a motivating woodwind ostinato here, a brassy stab cluster there, and tight, chattering strings and percussion). Combined with the characteristic fervour of Alice Zawadzki’s vocal delivery – “Sunrise breaks in the morning, people sleep through it all, missing out on the beauty of the time daybreak falls” – and the inspired placing of Tori Handsley’s harp, the piece takes on something of a ‘swinging Sixties London’ busyness; Meadows in no way takes centre stage, preferring to judiciously infuse the arrangement with lyrical alto until it all degenerates into cacophonous disorder. Lifecycles displays a broad, cinematic approach with a memorable brass-bold theme which evokes the pomp of Buddy Rich’s spectaculars, and improvisational meanderings add to the sense of the unexpected, as does the quirky, inventive openness of miniature The Spark. The written and the improvised are strikingly cross-pollenated in Intoxicated Delirium, an exciting showcase of near-perfect orchestral and band fusion, the brash energy reflecting its title – get it on repeat play! Hallucinogenic Euphoria hints at the prog world of Pink Floyd, the Indian inflections of Elliot Galvin’s piano strings, as well as orchestral strings, mingling superbly with Meadows’ echoic soprano; and the abstract beauty of Prelude easily suggests Bartok and John Tavener. Balmlike harp over desolate, searing, portamento strings in Remembrance seem to speak (in this First World War centenary year) of tentative, rising hope, the development becoming impressively filmic with the addition of Zawadzki’s hard, soulful vocals. Celebration effervesces in its scored/extemporised balance, Galvin’s unabashed piano bravura all part of the joy; and Laura Jurd’s bluesy trumpet prompts a four-square rockiness from the entire assembly which is irresistible and full of character. Jarring interlude Strife of Life explodes and then relaxes to Jurd’s lead before Twice The Man closes the suite – at almost nine minutes, it’s an impassioned, anthemic piece of writing which erupts into a huge Latinesque party, Meadows’ swirling soprano and Zawadzki’s pliant voice playing host to this unrestrained magnificence! Keep a keen eye on Engines Orchestra’s progress – a great initiative which is set to include workshops, ensemble performance platforms and artist development programmes, all with the aim of engaging communities of young musicians. And congratulations to Phil Meadows for his vision – a refreshingly different musical approach. Finally, a nod to Oli Bentley (split.co.uk) for the orchestra’s beautifully minimal ‘pulley’ branding, as well as the album’s neatly considered sleeve design. 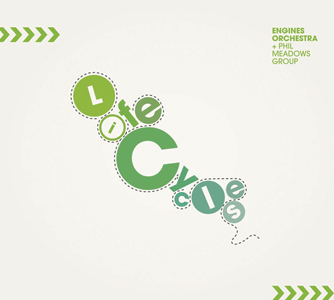 Launching at Kings Place, London, on 22 November 2014 (as part of the EFG London Jazz Festival), and with a general release date of 24 November, Lifecycles is available from the Engines Orchestra’s Bandcamp page. OVER THE LAST DECADE, thunderous New York jazz-funk fusionists Snarky Puppy have garnered a solid international fan base with their intoxicating live shows, as well as a successful catalogue of albums. At the heart of this creative powerhouse is English pianist/keyboardist Bill Laurance, who now presents his own sparkling debut release, along with a UK and Netherlands tour. Described by Laurance as the album he’s been searching for since he started making music, Flint is a collaboration with two close friends – Snarky stalwarts Michael League (basses, guitars) and Robert ‘Sput’ Searight’ (drums, percussion) – as well as a host of string and horn players. Together, they realise a magnificent compositional spectrum, often on an orchestral/filmic scale as well as anticipated jazz-funk grooving, with Laurance commanding at the grand piano and Fender Rhodes. And, although the majority of the ten through-composed pieces are solely from the leader’s pen (along with League’s considerable input as arranger), the communal sense of striving for both musical exactitude and improvisation is palpable… and exciting. Setting the tone are the complex urban drum patterns of opener Never-Ending City, with gutsy five-string bass, keys ostinati, cityscape strings and Laurance’s cool piano extemporisations. Janáček/Copland-style brass announces Money in the Desert, a brooding, quietly-pulsating episode which can’t help but break out into moog-driven funk with accented strings, and League’s popping electric guitar lead (blame it on the boogie!). 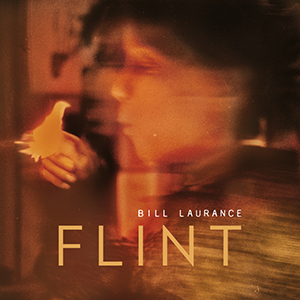 Title track Flint (named after the inspirational effect on Laurance of a Snarky Puppy gig in Flint, Michigan) is more akin to soundtrack, dipping in and out of marching band mode and expansive Philip Glass-like pianistic/orchestral vistas, underpinned by Sput’s metronomic pulse. And all the while, the arrangements feel organically whole. Smooth jazz Swag Times features quite breathtaking drum razzle-dazzle from Searight against an irresistible Rhodes/synth/vocoder wash – and again, brass and strings widen the landscape (such beautiful execution from string players who completed their entire recording requirement within a day!). The Good Things pares down the line-up to piano, bass and drums, Laurence leading in mysterious, echoic grandeur, plus impressive fuzz bass from League; and baroque-inflected Chia, with its gorgeously mercurial piano and double bass, invites the rapid gypsy fiddle of Zach Brock and portamento string backing to ramp up the tempo and augmented orchestration – in a word, delightful. Whimsical and grungy ska tune Smokers Castle jerks and clatters around Laurance’s detuned piano and a wonderfully brash New Orleans-style brass section; and Gold Coast features the fluid flugelhorn of Mike Maher (also of Snarky Puppy) in an orchestrally opulent, shining affair. At ten minutes in length, penultimate track Ready Wednesday is a sure highlight, Searight’s fast Latinesque tempo showcasing Laurance’s exacting, rhythmic piano style; and the broad orchestral sweep – even in its later, slower section – has ‘movie soundtrack’ written all over it. As closing titles roll, classical piano end-piece Audrey, with delicate strings and flugel, melancholily waltzes to its rest. As part of the package (on a second disc), a 47-minute DVD documentary – made by Andy Laviolette – provides a fascinating insight into the making of Flint, revealing the musicians’ passion for their art, as well as various triumphs over adversity along the way (including the sudden non-availability of their pre-booked studio, twelve few hours before recording sessions were due to begin!). Videos of all tracks are also included. Released on 14 July 2014, this is an ambitious and absorbing project – not least for the Snarky Puppy faithful – which promises much in its translation to a live setting (see below for October 2014 tour dates, samples and purchasing). Check it out!